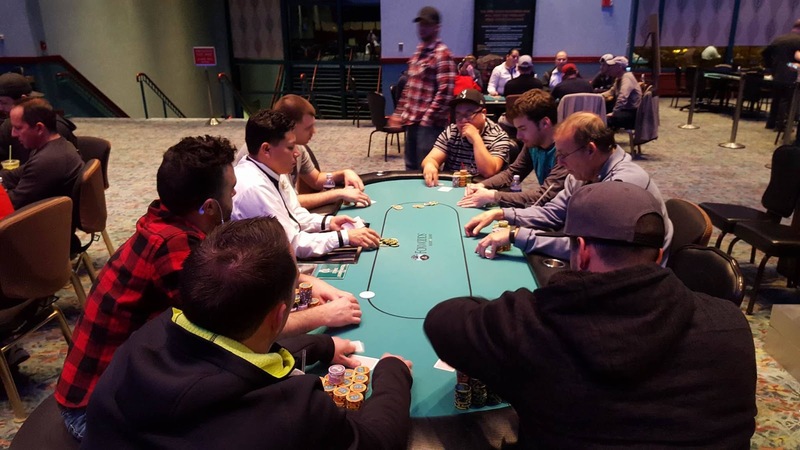 Matt Costanzo shoves all in, and Kevin Boesel calls. Costanzo is in good shape holding [qs][qc] against Boesel's [ac][qh]. The [7h][5c][3s] flop is safe for Costanzo, as is the [10d] turn. 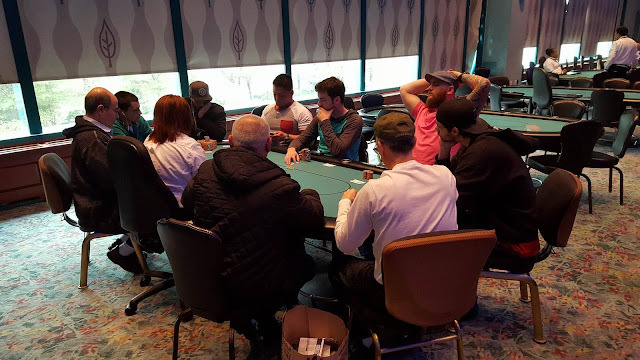 But when the [ah] comes on the river, Costanzo is eliminated from play and it's now heads up between Boesel and Matthew Wantman. After Marsel Backa recently got it in good against Kevin Boesel only to double Boesel up, he once again finds himself all in again against Boesel with the best hand. 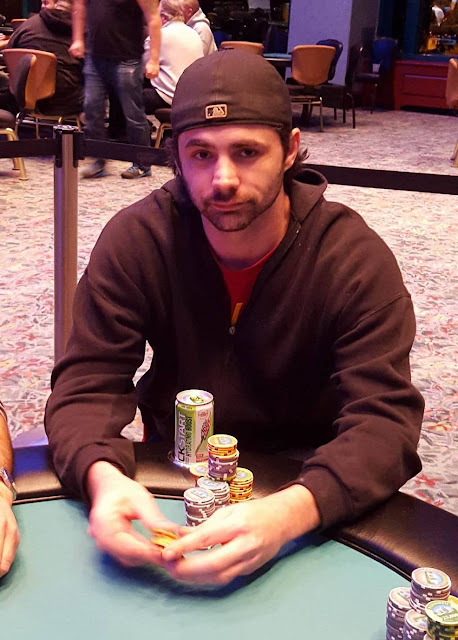 The [5d] turn and [7c] river do not improve Backa's hand and he is eliminated in 4th place, paying $19,311. 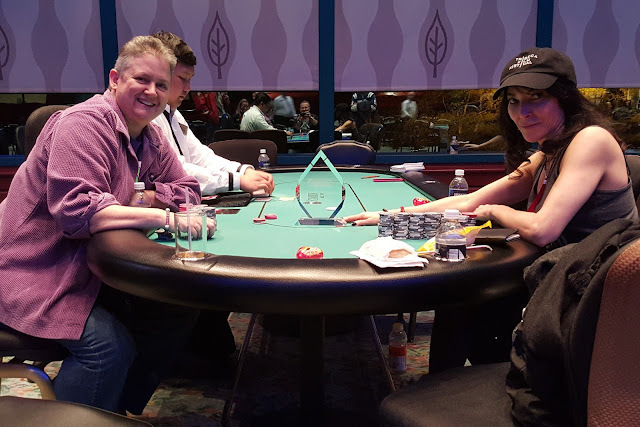 Kevin Boesel raises to 65,000 on the button, and Marsel Backa shoves all in from the big blind. "It's a gift," Boesel says to Backa as he turns over [9h][10h]. "Why would you call with that?" Backa asks Boesel. Boesel responds with, "Because I have a seven hour drive home, and I need to leave." The board runs out [10s][4h][3s][2c][6d], and Boesel is awarded a full double. Joe Przybcien shoves all in holding [jd][9d] and gets called by an opponent holding [ah][js]. 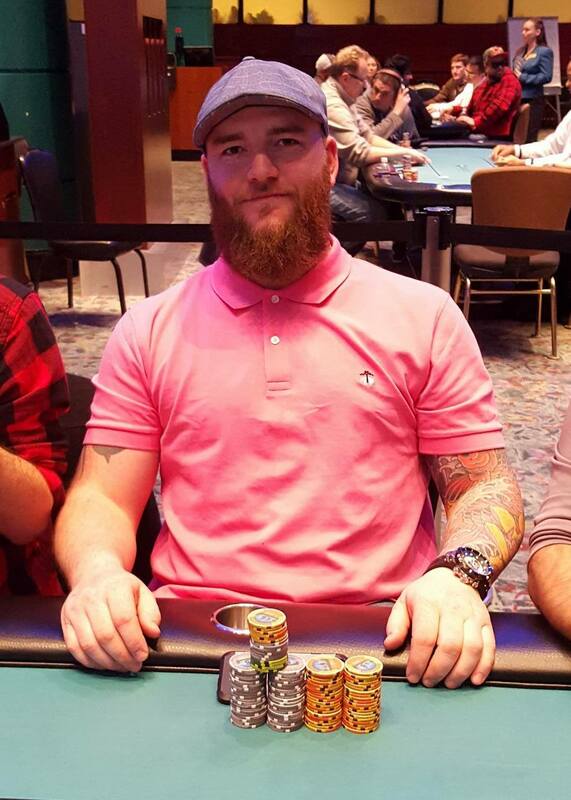 His opponent turns an ace to send Przybcien home in 5th place, paying $14,713. On a board reading [10h][9c][5h]7d], Kevin Boesel is all in and has been called by Joe Przybycien. When the [10s] comes on the river gibing Boesel the bigger boat, he openly celebrates. Action folds to John Cautela on the button who shoves all in. 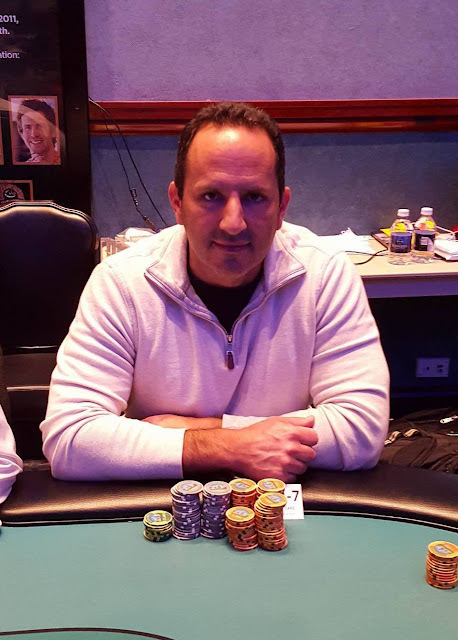 Matt Costanzo quickly announes that he is also all in from the small blind, and the big blind folds. 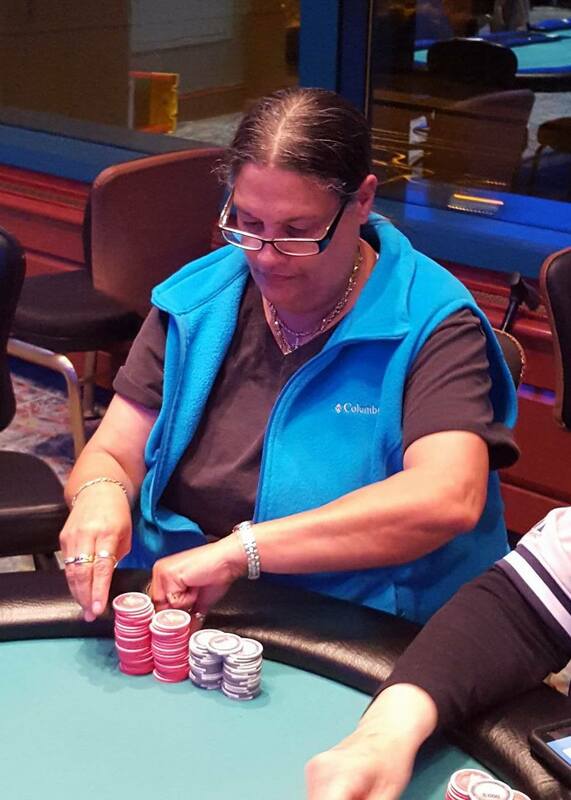 The board runs out [9c][4d][4s][8d][9d], eliminating Cautela in 6th place, paying $11,954. Paul Bradshaw shoves all in and is called by Matt Costanzo. 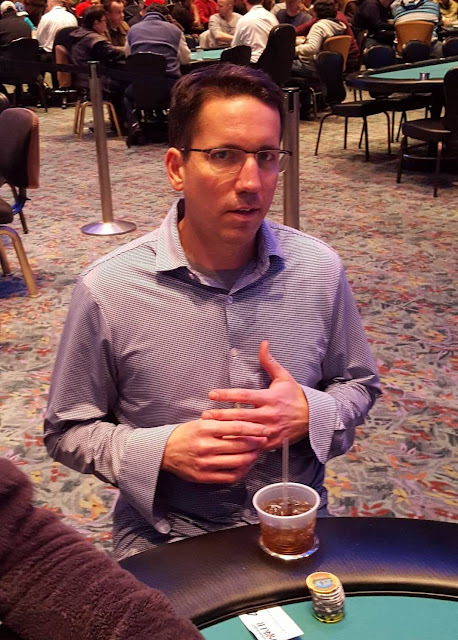 "That's exactly the kind of hand you want to play against aces," a player at the table not involved in the hand says to Bradshaw encouragingly. The board runs out [qh][7c][6d][ad][8h], sending the Irishman, and one of the hardest fighting short stack players of the day, home in 7th place. 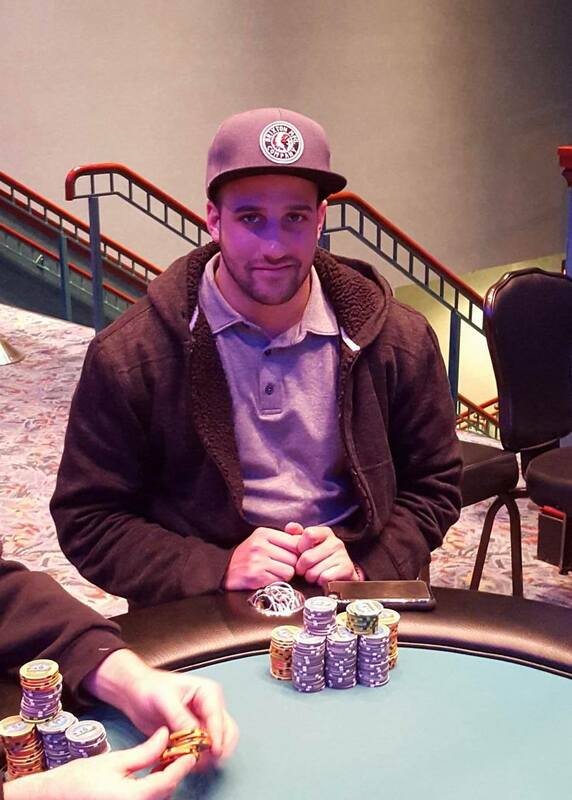 Giuseppe Ruvolo is all in and has been called by Matthew Wantman and Marsel Backa. The board runs out [2d][8c][7c][js][ah]. Ruvolo shows [10h][10d], but Backa shows [2h][2c] for a set, sending Ruvolo home in 8th place. Michael Farris shoves all in and Matthew Wantman quickly calls. 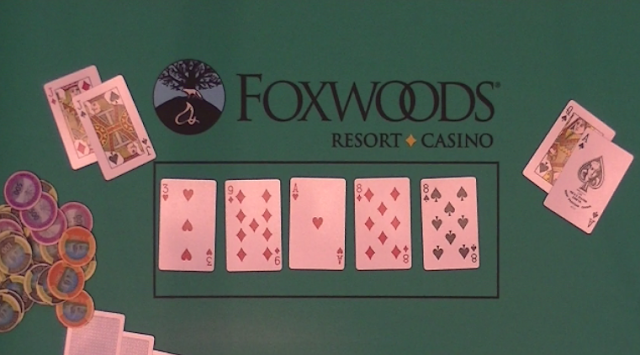 The flop and turn come [8c][kd][2h][5s], and the [ad] on the river seals the deal. 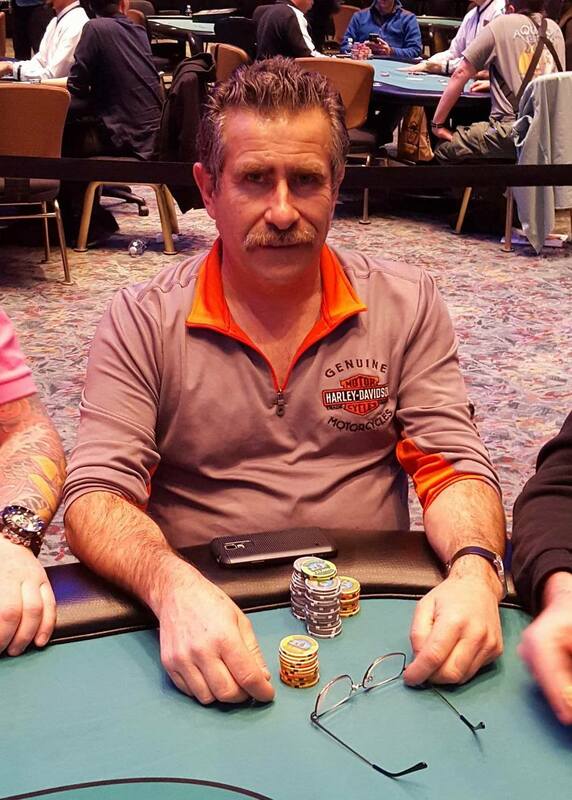 Farris is eliminated in 9th place, taking home $6,210. 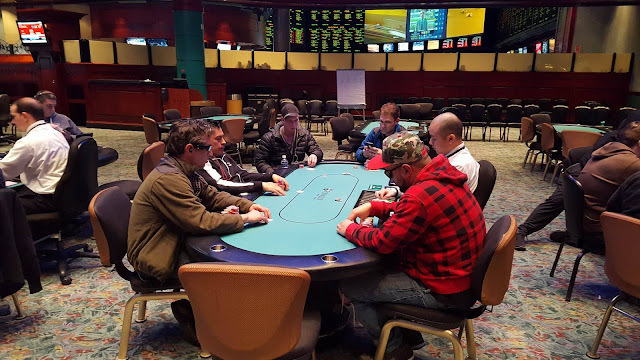 Marsel Backa raises to 36,000 in middle position, Paul Bradshaw shoves all in from the hijack, and Kevin Boesel also shoves all in from the big blind for less. Backa mucks [kc][10c] face up. 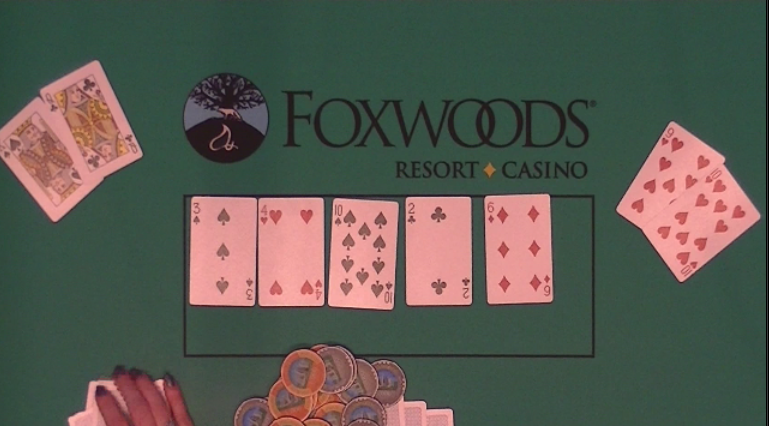 The board runs out [3h][6c][5s][js][jd], awarding Boesel a full double, and giving him the chip lead. 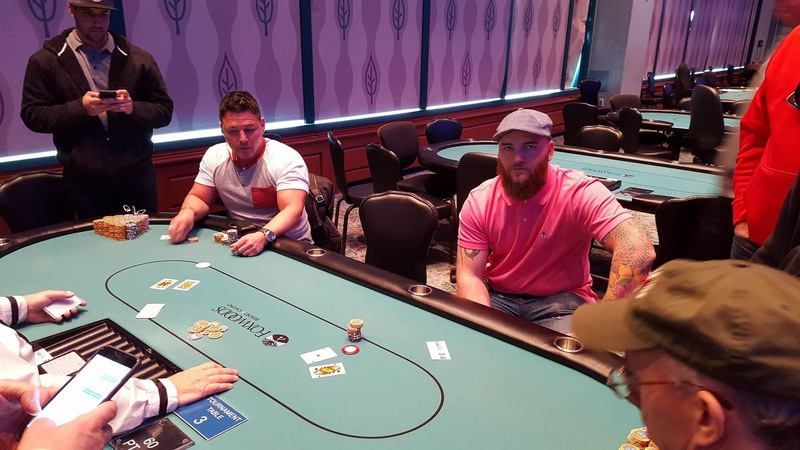 Kevin Boesel shoves all in and Giusseppe Ruvolo calls. 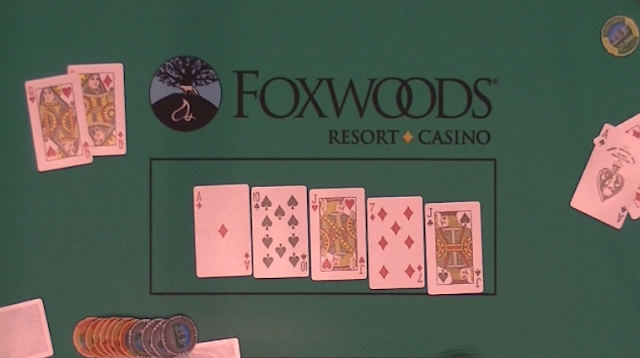 The flop comes [jc][8c][2h], leaving Ruvolo's queens far in the lead. The [10d] comes on the turn, leaving Ruvolo in the lead, but giving Boesel outs to a straight. 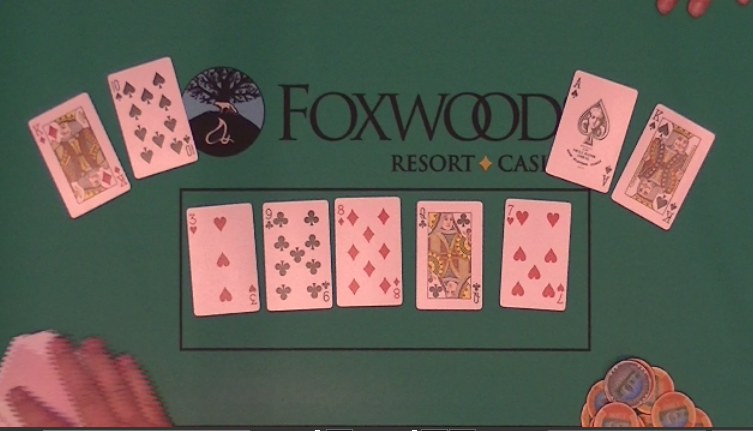 The [qd] comes on the river, giving Boesel the straight, and a full double up. "Every time on the river," Ruvolo says as his chips are passed to Boesel. 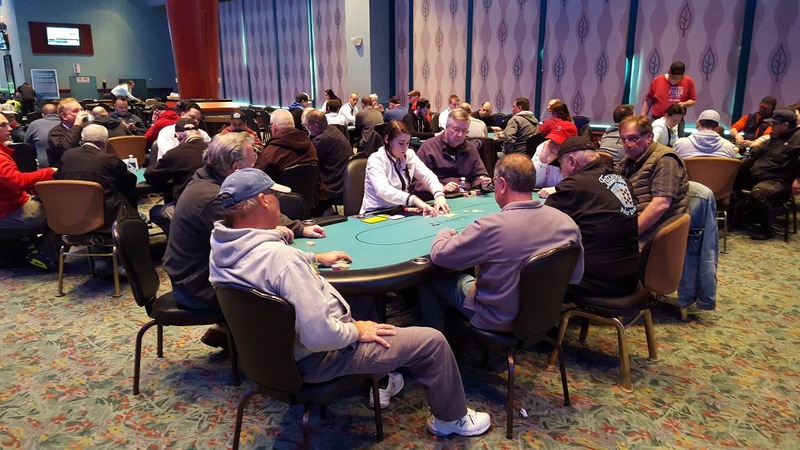 There were a total of 47 entries into today's $300 7-Card Stud 8+event. There were a total of 111 entries into today's $400 NLH Six-Max event. Play will resume in 60 minutes. When we reach the final ten players, they will redraw for the final table and we will bring you a full list, along with chip counts. Paul Bradshaw is all in holding [ad][kc], and has been called by Rob Ticktin holding [ah][qc]. "Oh come on man, I told you to fold," Bradshaw says to Ticktin. Another player at the table says, "You want this man, you have him dominated." But despite encouragement from his table mates, it's apparent that Bradshaw is weary of the call. The flop comes [3c][3d][2d]. When the [7c] comes on the turn, Bradshaw says, "Come on man, no seven, no three, no two." It's the [9h] on the river that awards Bradshaw a full double. 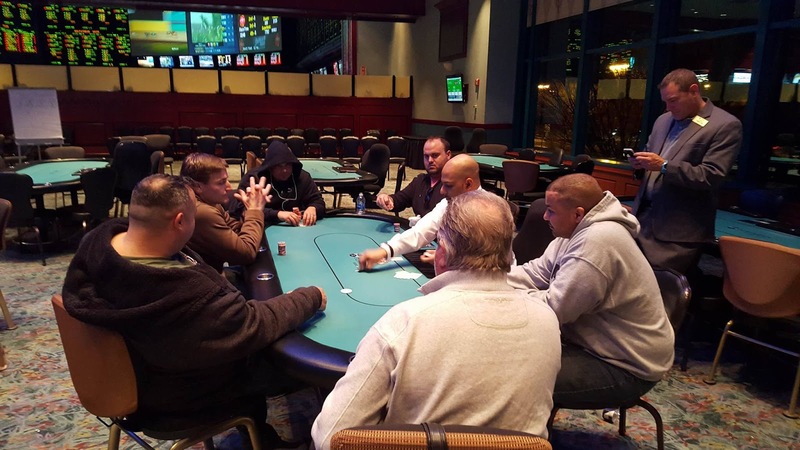 The 9:00am $60 No Limit Hold Em tournament is canceled on Monday, but all other tournaments are on as scheduled. We hope to see you here at Foxwoods for Event #14 Flights A and B ($400 NLH Sponsored by the PPC Tour), the evening satellites and 8:30pm $100 NLH Bounty Tournament. For a full schedule of tomorrow's events please see this link. Mark Schumacher shoves all in on the button, and Matthew Wantman calls in the big blind. 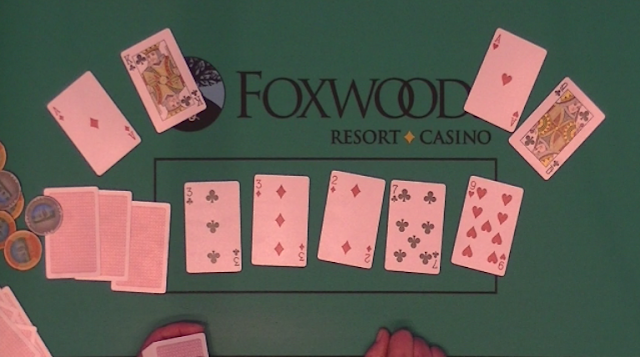 The flop comes [ad][10s][jh], giving Wantman two pair. The [7d] comes on the turn, and the [js] on the river gives Wantman a full house, sending Schumacher home in 12th place, with a $4,367 payday. Matthew Wantman raises to 17,000 in middle position, Marsel Backa calls in the hijack, and Fred Paradis shoves all in from the cutoff. Wantman and Backa both call. Wantman and Backa both check it down as the board runs out [ah][jh][2s][js][9c]. 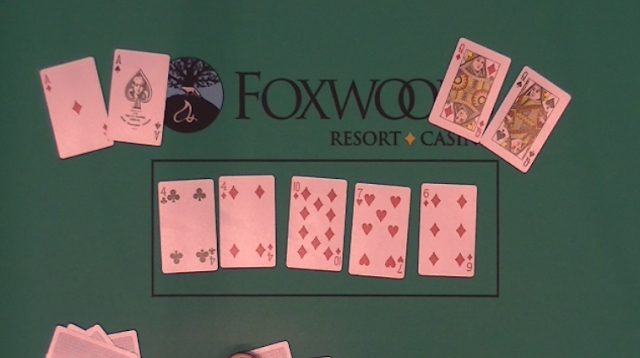 Wantman turns over [as][6s], Backa shows [kc][ks], and Paradis mucks his hand. 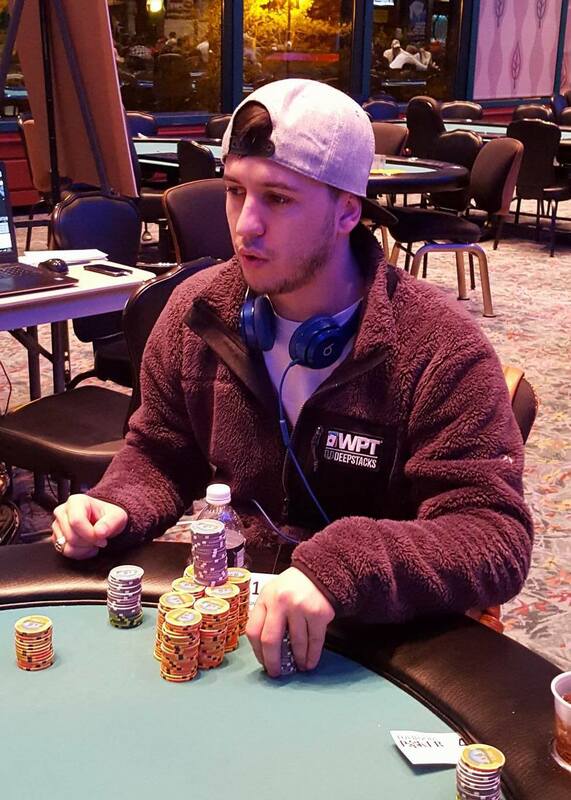 Wantman wins the pot, and Paradis is eliminated in 18th place, paying $3,678. Soukha Kachittavong shoves all in for 85,000 on the button, and Michael Farris calls in the small blind, having Kachittavong covered. The board runs out [3h][9c][8d][qc][7h], eliminating Kachittavong from play. All remaining players are now in the money. 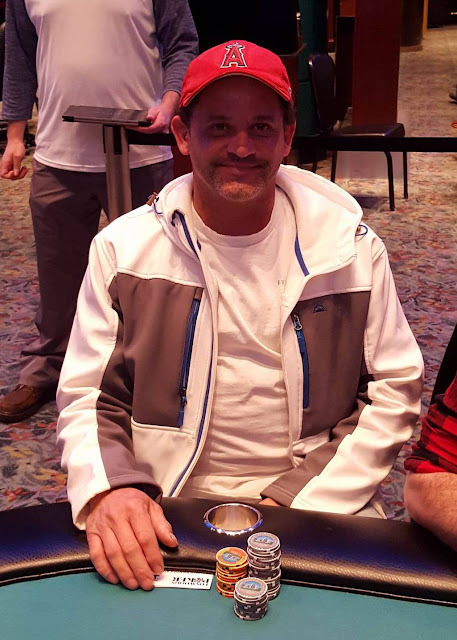 Mark Schumacher raises to 16,000 in the hijack, Dan Schimmel shoves all in for 44,000 total in the cutoff, and action folds to Paul Bradshaw who tanks in the big blind, but ultimately folds his hand. The board runs out [kd][8s][8c][6d][kh], awarding Schimmel a full double. The remaining 19 players are now playing Level 20, with 4,000/8,000 blinds, and a 1,000 ante. We will continue hand for hand play until the money bubble has officially burst. After a previous hand where he tripled up, John Bradshaw finds himself all in again. This time, James Frangoulidis raises to 15,000 on the button, and Bradshaw shoves all in from the small blind for 51,000. Frangoulidis calls. The board runs out [9c][7h][2d][2c][7s], awarding Bradshaw another double to keep him alive on the money bubble. John Riley is all in, and has been called by Soukha Kachittavong. The board runs out [4c][4d][10d][7h][6d], awarding Riley a full double up on the money bubble. Paul Bradshaw shoves all in for 20,500 and is called by Mark Schumacher in the cutoff and Matt Costanzo in the small blind. The flop comes [10d][8s][7d]. Costanzo checks, and Schumacher bets 65,000. Costanzo folds and says, "You better have it." When the [kh] comes on the turn, Bradshaw breathes a sigh of relief after turning two pair. 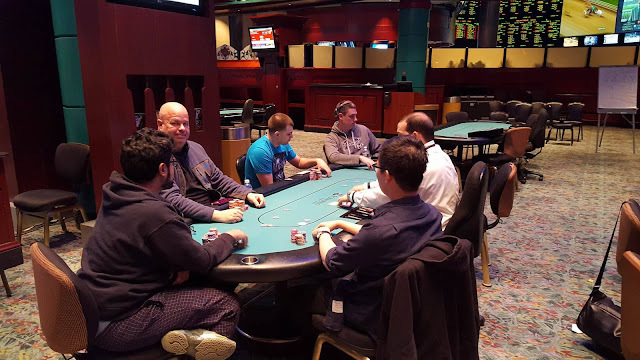 The [8d] on the river gives Bradshaw a full house, and he goes from having three big blinds to just a bit over ten big blinds. Registration is now closed and we will bring you the prizepool information soon. There are 19 players remaining, with 18 getting paid. The remaining players are now hand for hand until the money bubble bursts. Soukha Kachittavong shoves all in and John Riley calls from the big blind. The flop comes [8h][3d][10h], giving Kachittavong a set of threes. The [js] turn and [4d] river ensure a full double for Kachittavong. John Cautela min raises under the gun and Steven Tabb calls in the small blind. Both players check the [ac][6c][5c] flop. The [qc] comes on the turn. Tabb checks, Cautela bets 14,000, and Tabb calls. Both players check the [3c] river. Tabb turns over [6d][6s] having flopped a set. Cautela shows [as][ks]. It's a chopped pot with both players having a flush (playing the board). As a reminder, we are streaming a feature table (and the final table when we get down to 10 players. The link to the sight is www.foxwoodslive.com. Joe Przybycien shoves all in from middle position, and Soukha Kachittavong calls in the hijack. 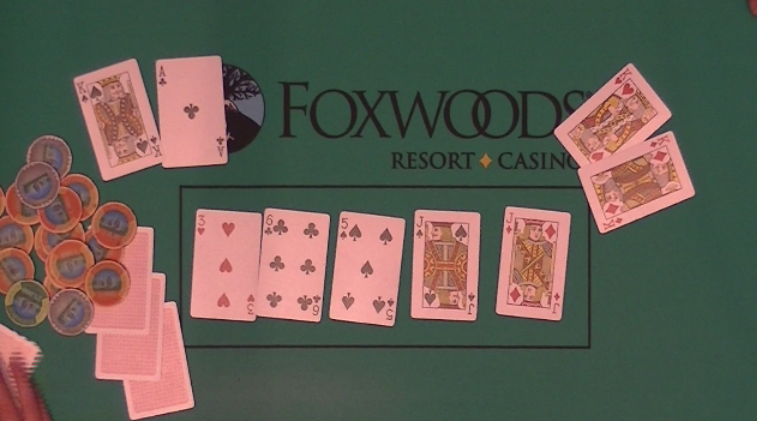 The flop comes [3h][9d][ah], giving Przybycien a pair of aces. The [8d] turn and [8s] river maintain Przybycien's lead and he is awarded a full double. Event #12 is now under way. 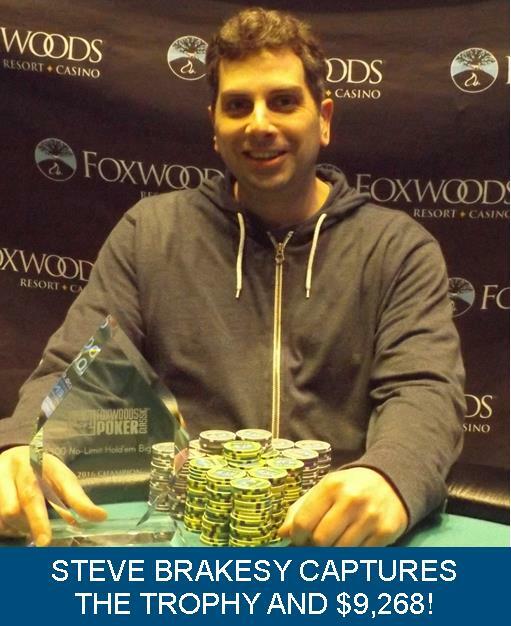 This tournament boasts a $25,000 guarantee along with 20,000 in chips. Levels 1-12 will be 30 minutes in length, and Levels 13 will be 40 minutes in length. Registration will be open until the start of level 9. 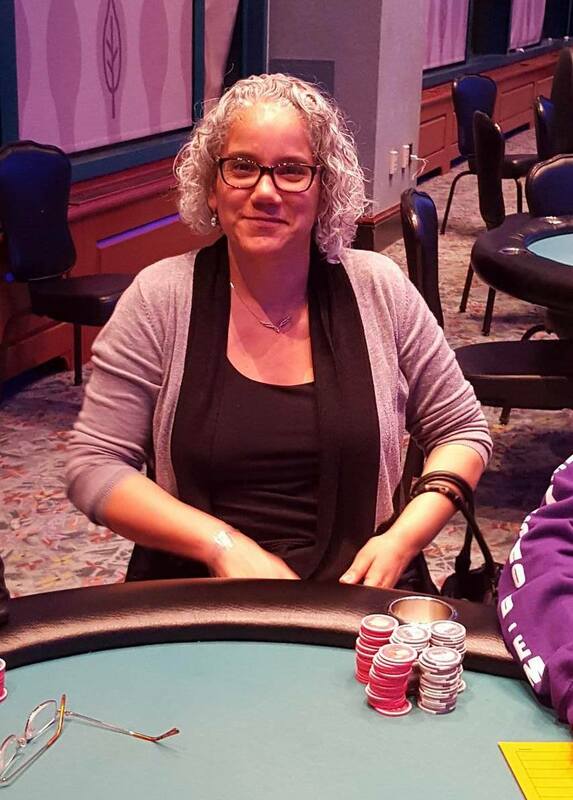 After the previous hand against Linda Swears, Sharon Raider has won Event #9 ($250 NLH Ladies). 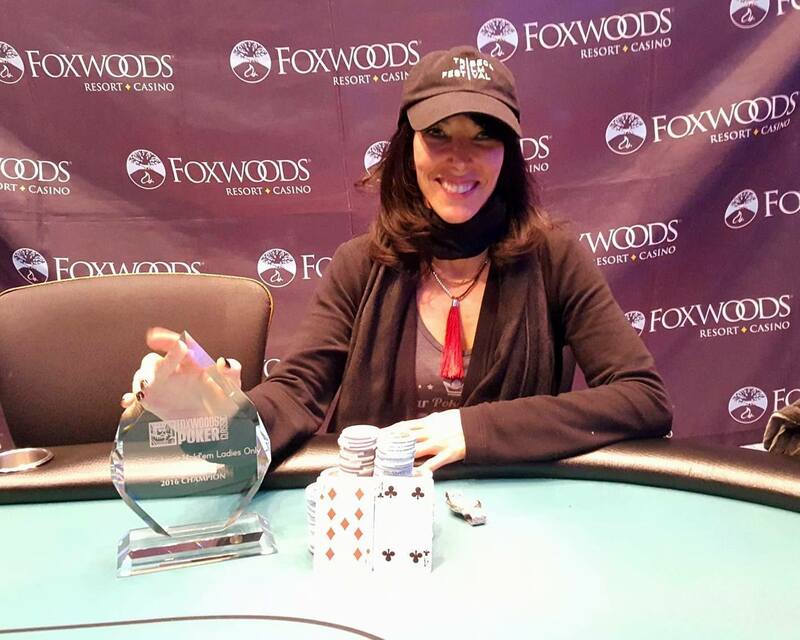 She will take home the trophy and the $4,552 top prize. On a board reading [7c][6c][5s], Linda Swears shoves all in, and Sharon Raider calls. The [3c] on the turn gives Raider the straight and the [kd] on the hand does not change the hand. 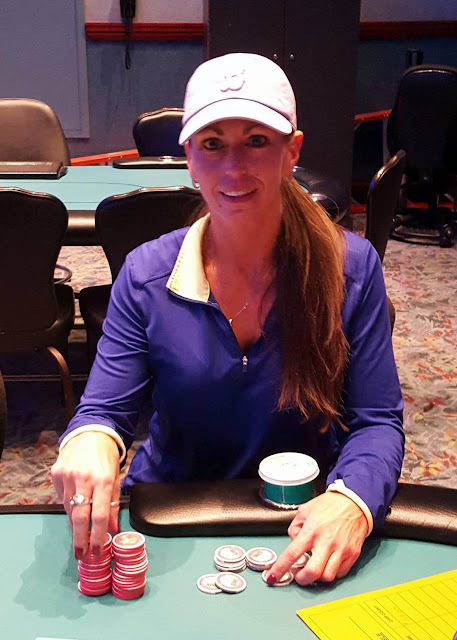 Swears is eliminated in 2nd place, and Sharon Raider wins the ladies event. Sharon Raider raises to 140,000, and Linda Swears shoves all in. Raider quickly calls. "King me," Raider says multiple times as the board runs out [7d][4s][2d][3c][2h]. Raider is awarded a full double up. Linda Swears shoves all in, and Sharon Raider calls. "Those are two monster hands for heads up," Swears says. The board runs out [7c][6s][5h][qh][9h] awarding Swears a full double, and she has now taken over the chip lead. 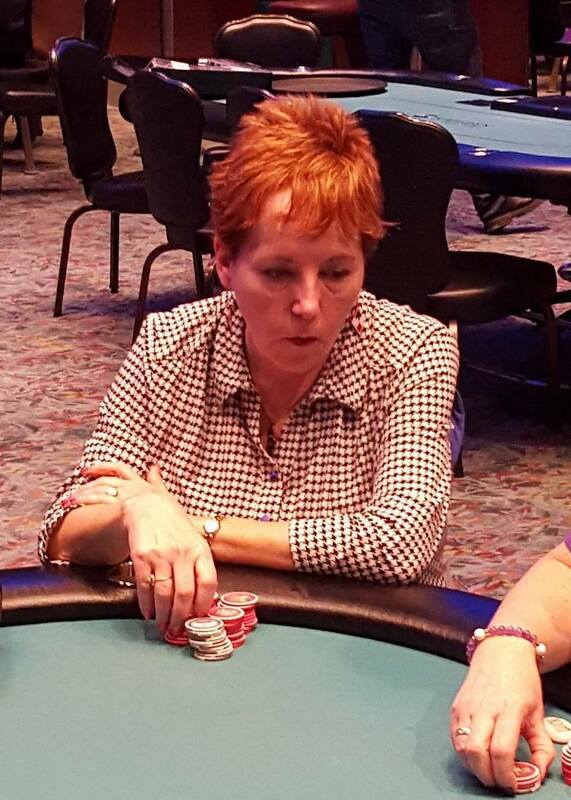 Sharon Raider has a three to one chip lead going into heads up against Linda Swears. On a board reading [7c][6s][5h], Jill Chamberlin checks in the small blind, Linda Swears shoves all in from the big blind, and Sharon Raider folds on the button. Chamberlin says, "I am tired, I call." The [qh] on the turn does not change the hand, but the [9h] on the river gives Swears the straight, and Chamberlin is eliminated in 3rd place, taking home $1,900. 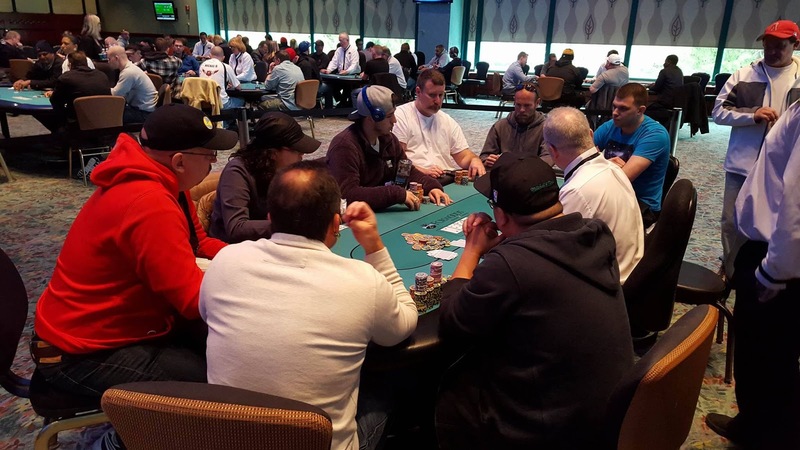 Players will play three more hands before bag and tag. There are currently 29 players remaining. Players are nearly done for the evening. In the next five minutes the remaining players will play a certain number of hands (tbd), and then bag and tag to return for Day 2 tomorrow at noon. 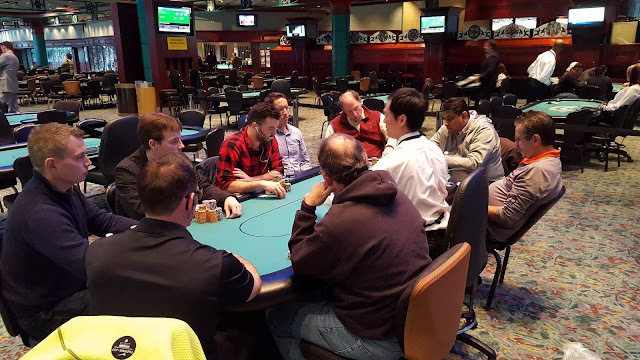 One of the tougher tables for the last few hours has been that of Nick Palma, Soukha Kachittavong, Steven Tabb, and Matthew 'Bucky' Wantman. Linda Swears shoves all in after Jill Chamberlin opens, and Chamberlin calls. 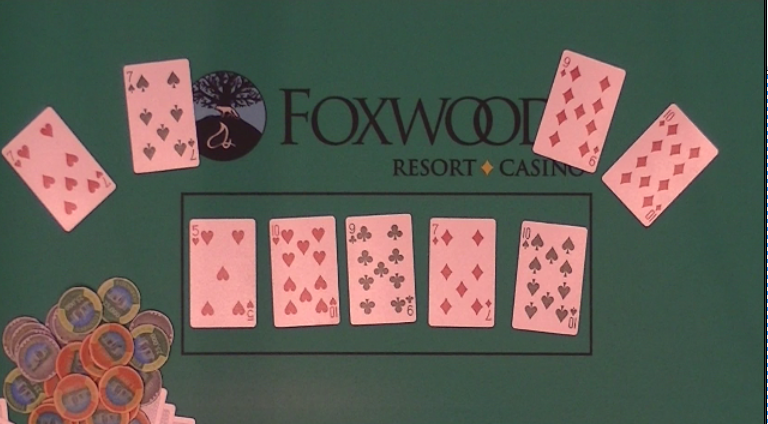 The board runs out [jd][9h][5h][6d][5h], awarding Swears a full double up. On a board reading [kd][4d][2c], Le-Ann Anderson shoves all in, and Jill Chamberlin calls. 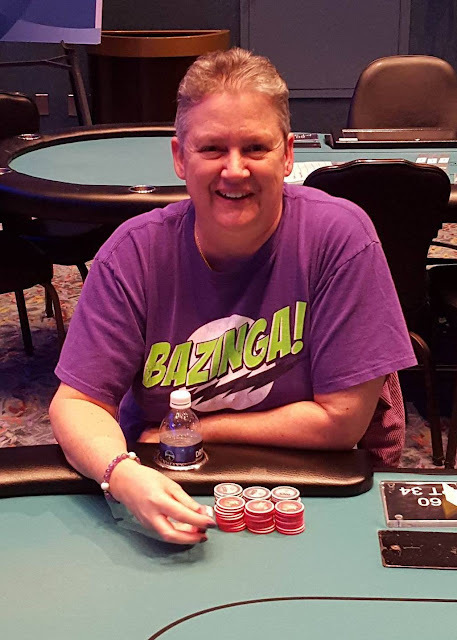 The [9h] turn and [4c] river mean Chamberlin will win the pot with her trip fours, and Anderson is eliminated in 6th place for $1,900.